This evening, just as a Shell-sponsored performance by the Sao Paolo Symphony Orchestra was about to start, a 15-strong choir suddenly stood up in their seats behind the stage, in full view of the audience, and began to sing. They launched into a version of the classic spiritual song Wade in the Water, with rewritten lyrics drawing attention to Shell’s controversial human rights and environmental record. 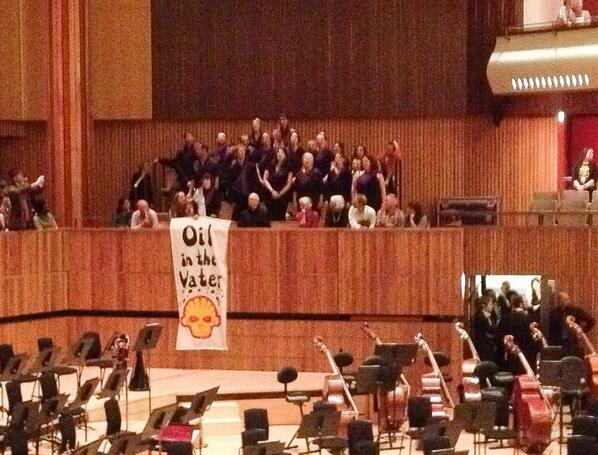 The audience listened and clapped along as the choir sang verses based on Shell’s polluting activities in the Niger Delta , the Canadian tar sands  and the Arctic , and applauded as the singers unfurled a banner reading “Oil in the Water” and bearing an evil-looking Shell logo. There was further applause as the song ended, and the choir then proceeded to the bar where they performed again before leaving the building. Security guards looked on but did not interfere. Shell Out Sounds is part of the Art Not Oil coalition, along with other groups seeking to kick oil sponsorship out of the arts such as Liberate Tate, the Reclaim Shakespeare Company and London Rising Tide. The tar sands are one of the most carbon-intensive and environmentally destructive sources of oil in the world. Current production is located mainly in Alberta, Canada, where tar sands deposits cover an area of 140,000 km² – an area nearly as big as England and Wales combined. Shell is one of the largest players in the tar sands, producing approximately 276,000 barrels per day or roughly 20% of total exports from Alberta, and has applied to expand its capacity to a projected 770,000 barrel per day capacity. 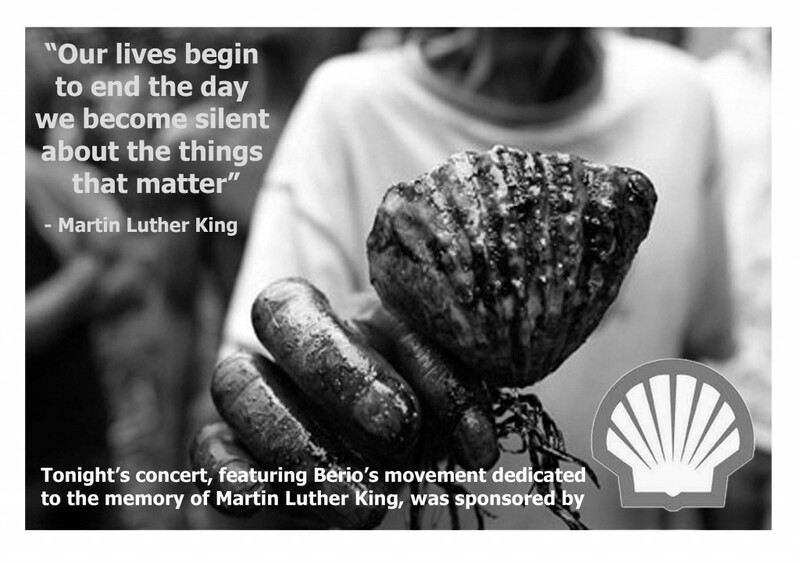 However, strong community resistance to Shell has damaged its reputation with both shareholders and the public. It has been named in five lawsuits related to tar sands developments and has faced shareholder resolutions demanding greater clarity over the risk of tar sands investments. 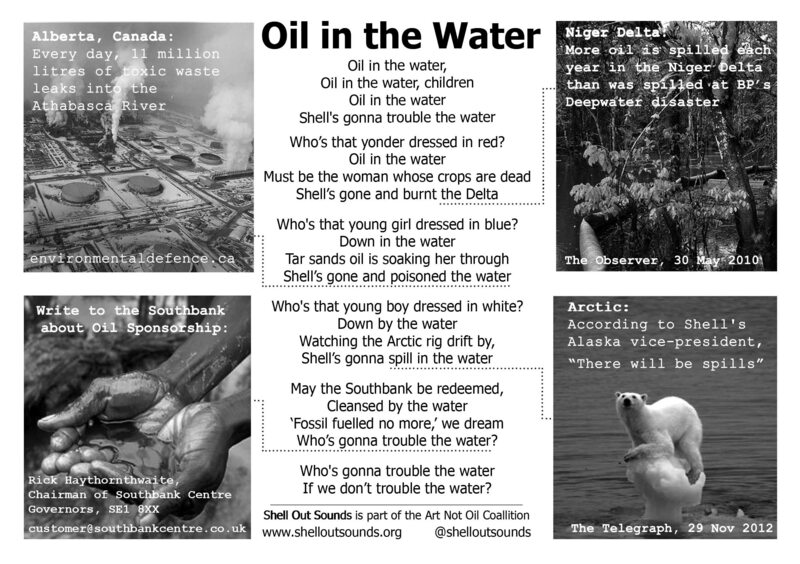 Shell has been the most aggressive company seeking to exploit the pristine Arctic Ocean for offshore oil. Shell has been planning for years to drill outer-continental shelf wells in the Chukchi and Beaufort Seas off Alaska. Dozens of support vessels and aircraft would patrol both seas, emitting pollutants and risking oil spills. If an oil spill were to happen in the Arctic’s extreme, remote conditions, there is no proven method to clean it up. Following a global campaign to revoke the drilling licences Shell has received from the US government, at the end of February 2013 Shell declared that it was cancelling its plans to drill for oil in the Arctic during 2013. However, it has not cancelled its plans altogether, and without stronger legal protection for the Arctic Shell will almost certainly try to return. The movement “O King”, dedicated to Martin Luther King, is part of Berio’s Sinfonia which was performed in the second half of tonight’s show with the Swingle Singers. Shell out Sounds has performed at the Southbank on four previous occasions, but this is the first time the choir has sung inside the Royal Festival Hall itself rather than in the bar or the foyer.